Is any consensus forming on a solution to the "Lithium Problem"? In the dark ages between recombination (~0.4 Myr post-BB) and reionization (~300 Myr post-BB) of atoms, there was not any condensed-phase matter (except maybe some form of dark matter), nor radiation exchange other than Lyman-alpha. The only light was a warm cosmic background, and virtually all ordinary matter was in the form of neutral atoms of primordial elemental distribution (H, He, and traces of Li, B, C, N). Collapse of gas to form stars on any useful timescale was inhibited by the gas's transparency (in the sense of emission, not absorption of photons). Transparency prevented heat loss by radiation, which prevented the compression of the gas under gravity. A dark, eventless place with few landmarks. Eventually, somewhere around 100-500 Myr, the expansion of the Universe as a whole cooled it down to where H2 molecules could form, allowing better radiation away of heat when collapsing a parcel of gas. A certain amount of lumpiness is needed however and this structure, perhaps on several scales, along with proper motion, would determine several things: collisions between parcels, scale & timescale of individual star formation, and the amount of chain reaction in star formation (supernovae -> triggering more star formation -> more supernovae). My intuition is that with 100's of M's of years to even out and settle down, it would be surpassingly smooth and quiescent. When you say transparency, I think you mean opacity? Nope, transparency (lack of opacity). If the gas had some opacity, it would be able to cool (actually, get less hot) while collapsing to a star. Errr... cooling is more efficient in a transparent (optically thin) gas, I think? Because radiation from a cooling process can escape from anywhere in the gas, instead of only from the surface. And collapse is easier for an optically thin gas, because there is no radiation pressure support. Or maybe I'm missing something important? You are correct for circumstances we are used to in astrophysics, but if the gas that is cooling is EXTREMELY transparent, it has no way to emit photons in the first place. This limitation precedes the process you are thinking about, which is the prevention of the escape of any emitted photons. @Aabaakawad: the only way to approach this would be by modelling. I don't know if we have any site members involved in this area but I think not. Your best option would be to do a literature search. I see when posed this Q, I did not have a clear idea of the scale I was looking for. Most likely we are talking intra-galactic scale, but galactic scale may come into play if ionization is first achieved with quasars rather than stars. I've located a paper that goes into great (excruciating?) detail on the 21cm power spectrum (of baryons) in the dark ages. I won't pretend to have the expertise to understand the whole thing, but I'll try to bring out a couple of relevant points here. Note that this is all theoretical work in the framework of the standard cosmological model since actual observations of the 21cm power spectrum are apparently fiendishly difficult, most likely involving a radio observatory on the Moon. There is actually more power on smaller scales ($l$ goes to $>10^6$ here!). 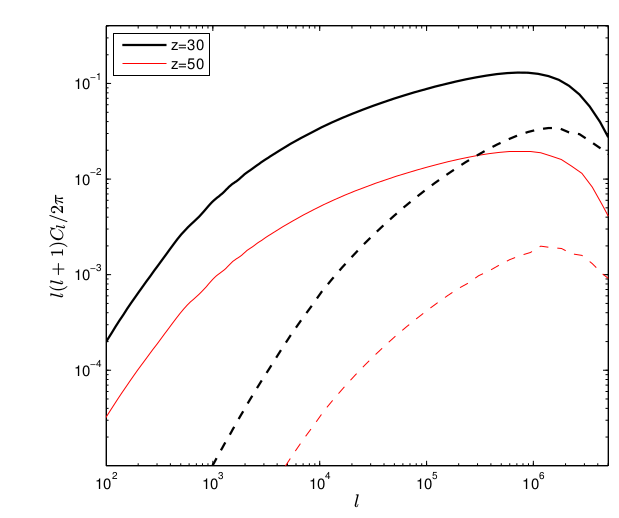 They note that the perturbations in the baryon distribution are less than the perturbations in the dark matter distribution because the baryons feel pressure. I think this is more or less what you're alluding to when you talk about 'evening out and settling down'. I think the point you may be missing, though, is that the baryons are also trying to settle into the potential wells of the dark matter distribution, which is not smooth since the dark matter feels no pressure and so can begin collapse as soon as the horizon is big enough. These slides may also be of interest, and if you want to get your hands dirty there's this source code. @Aabaakawad $l$ is the multipole moment. This corresponds to an angular size on the sky, which, given a distance, corresponds to a length scale. There's a plot in the slides I linked (p 14) that has $l$ and wavenumber in kpc^-1 for z=50 to give you an idea. On the other axis $C_l$ are the multipole expansion coefficients. The overall quantity is (proportional to) the power in each mode. If you look up CMB power spectrum you should find lots of introductory stuff on this (but careful with the $l$ to $k$ conversion, which is redshift dependent). @Aabaakawad pretty much, I'm afraid. You asked a hard question, and the answer is pretty technical. But hey, there is actually an answer, which isn't always guaranteed! (well, at least a solid theoretical answer, no measurement). "My intuition is that with 100's of M's of years to even out and settle down, it would be surpassingly smooth and quiescent." 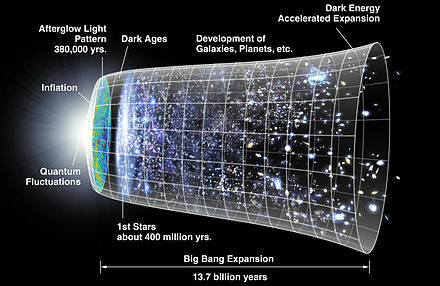 which happened around 380.000 years after the Big Bang. CMB is very uniform and fits a black body spectrum with great accuracy, and this uniformity could not be explained using thermodynamic arguments, since large parts of the universe were in a different light cone by that time. 9 year WMAP image.The radiation is isotropic to roughly one part in 100,000.The detailed, all-sky picture of the infant universe created from nine years of WMAP data. The image reveals 13.77 billion year old temperature fluctuations (shown as color differences) that correspond to the seeds that grew to become the galaxies. The signal from our galaxy was subtracted using the multi-frequency data. This image shows a temperature range of ± 200 microKelvin. The Universe that we see today is very lumpy. There are planets, stars, galaxies, and clusters of galaxies. Yet when we look at the afterglow from the Big Bang, we see an incredibly smooth glow across the sky. So how did the matter in the Universe get to be so lumpy after starting out so smooth? Astronomers generally agree that gravity shaped the evolution of the lumps we see in the Universe today. The force of gravity between different chunks of matter caused the chunks to pull together into one body, and then that body pulled in more material, similar to a snowball rolling downhill, picking up more snow as it goes. But each snowball must have a beginning – a small "seed" around which the other material will gather. Observations of the cosmic microwave background (CMB) – which is as close as we can get to seeing the Universe near its beginning – show that it has a temperature that is very close to uniform. The temperature of the CMB is a tracer of where matter was in the very early Universe. If the temperature was completely uniform, there would be no seeds for gravitational collapse – no way to form the lumps we see today. By the time of the dark ages the kernels for the lumpiness were there since the inflation period before 10^-32seconds. This seems to be related to the question, but doesn't appear to actually answer it? Ignoring CDM for the moment, and given the primordial lumpiness, gravitational evolution toward anisotropy would be fighting pressure evolution toward isotropy. Using my intuition again, as scale -> 0, medium would smooth, as scale -> horizon, medium would sort/differentiate. At some scale L in between, there would be transitional behavior. This scale L might vary with time. You are also ignoring Special Relativity which is embedded in General Relativity. In the years before photon decoupling the universe could not communicate in its whole volume to reach thermodynamic equilibrium due to the light cones. Without GR there exists no Big Bang model to intuit anything about it. I am saying that the seeds of anisotropy at the epoch you are proposing have started during the inflation period. The process of starting lumpiness. Locally one can use thermodynamic arguments for how lumpiness evolves to observed stars etc but there was no homogeneity to start with. One has to start with the primordial seeds. Sorry about the chat but we are at different time zones.